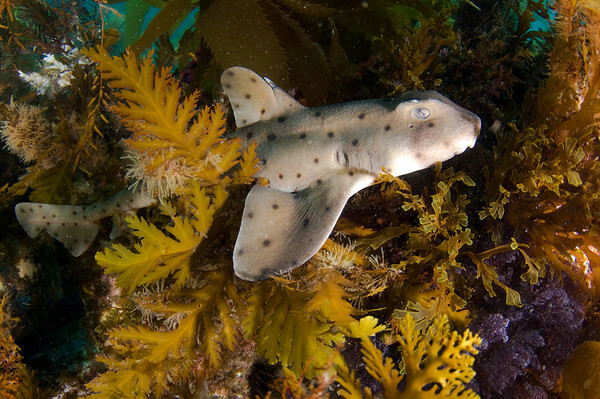 Most sharks can be skittish, don't use too wide a lens, or too slow of a lens. the 12-24mm or 17-35mm are good choices. Set your strobes on manual, low power - be careful not to blow out their white underbellies. I think sharks look best when photographed from slightly below, so you can see the side and belly of the shark. Photo by Rand McMeins. 10-17mm fisheye lenses are generally too wide. 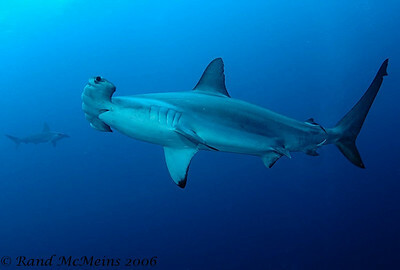 Use the 12-24mm rectilinear range for more skittish sharks, and closeup shots. The focal lengths are for cropped-sensor cameras. If shooting full frame, the 17mm - 70mm range is best, especially 17-35mm. Use a fast lens with a maximum aperture of F2.8 or F4 and a constant aperture throughout the range for best results. 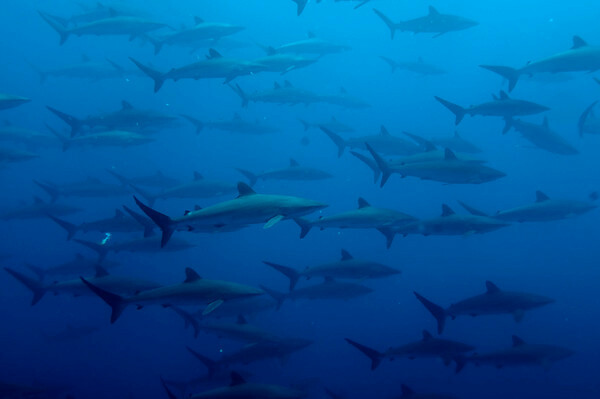 Silky Sharks, Malpelo Island near Cocos. Nikon 12-24mm at 22mm. F8, 1/125th, ISO 200. Photo by Randy Harwood. For reef sharks, the background can make all the difference. Work hard to get a good, colorful background. Set your exposure for M (manual), ISO 200, set shutter speed to 1/125 or faster, never slower as even a moving shark will have motion blur at slower speeds. Use only high power strobes like the Sea and Sea YS-250 or Ikelite DS 200 for fast recycle time. Set your strobe (s) to 1/4 power or less to maintain a fast recycle time and tame down the power to prevent overexposure of the sharks white underbelly. Try F5.6 for far away shots or dark background water, F8 for medium distances and average background water, or F11 for close shots and bright conditions. Vary strobe power as needed to reduce overexposed whites of the sharks underbelly. When using your strobes, you must be careful to avoid backscatter and blowing out the highlights of the shark's ventral side. Careful strobe placement and use of low strobe power settings will enhance the quality of your images. 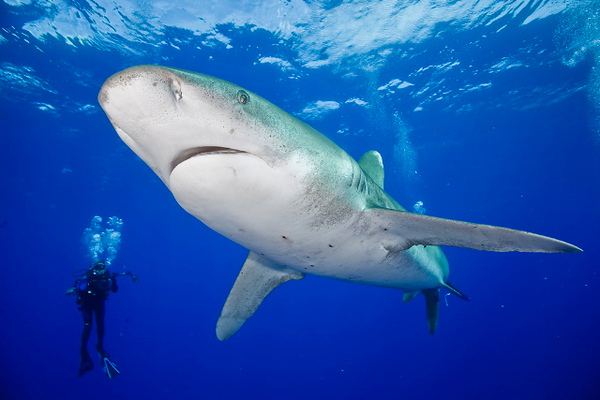 Oceanic whitetip shark, photo by Andy Sallmon. Diving in cages with great white sharks has it's own set of challenges. Some spots in cages are better than others, so make sure your trip hosts will rotate with the other passengers before going on a trip. You also can't get so scared you can't press the camera shutter. Are you ready to try your hand at Great White shark diving? Turn down your strobes. Light from silvery fish is reflected directly back to you, so put your strobes on low power. 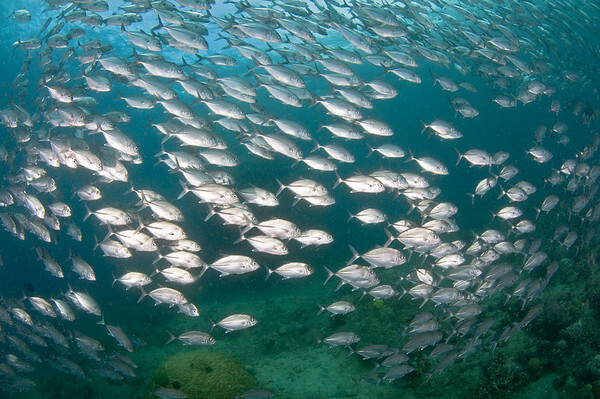 Use a fast shutter speed if the fish are moving quickly to freeze their motion. I had to put my strobes on manual power to shoot these silvery jacks. 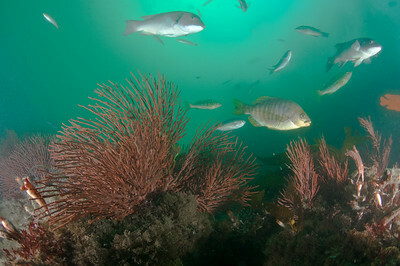 Sea Fans - get close, use a 10mm fisheye lens, for maximum color saturation. Don't over exposure the colors, watch your 3-color histogram for blown out colors. 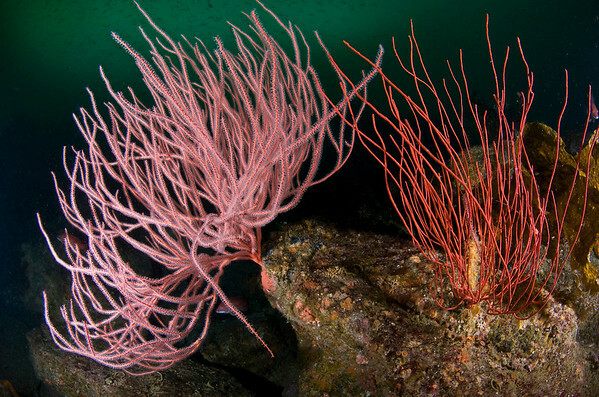 I shot this sea fan from about 18 inches away at 14mm, I should have opened up to 10mm and got even closer, but I didn't want to risk too much backscatter. Here's I'm shooting at 10mm with my fisheye lens. I'm less than 2ft away, and got nice color and sharpness. Black fish - use manual strobe power, use side lighting to highlight detail on the fish.. try to highlight the eye in the photo. bracket with different strobe settings and positions. Black and white subjects - these subjects will often look best in front-lighting, due to their higher contrast. Strong surge - it strong surge you should have a few extra pounds on your weight belt, let more air out of your BCD. Shoot macro with your strobes (no ambient light), use the fast sync speed of the strobes to freeze objects that are swaying in the surge. If the photos aren't sharp, open your aperture or shoot at a higher ISO to get a shorter strobe burst duration. Low light - in low light situations, such as at twilight or when you are very deep, you may need to increase your ISO to get the depth of field and shutter speeds that you want for a shot. Slower shutter speeds will be necessary for wide-angle shots if you don't want the background to be dark. Worse case, try to at least use a shutter speed of 1/10th - 1/20th of a second for WA shots of still objects. Try to hold the camera very still to avoid camera shake. If there are moving objects, your only options will be to freeze their motion with your strobes, or shoot wide open aperture (your largest aperture your lens will allow) and increase your ISO until you get the shutter speed you need. High contrast shots- high contrast shots can be quite dramatic, and involve very bright areas and dark shadowy areas. Shoot at base ISO to get the most dynamic range out of your camera. use your strobe to freeze the movement of fast-moving fish. you'll probably be shooting mixed ambient light + strobe light, so use a shutter speed on at least 1/125th to freeze the motion, unless you are going for a creative effect. 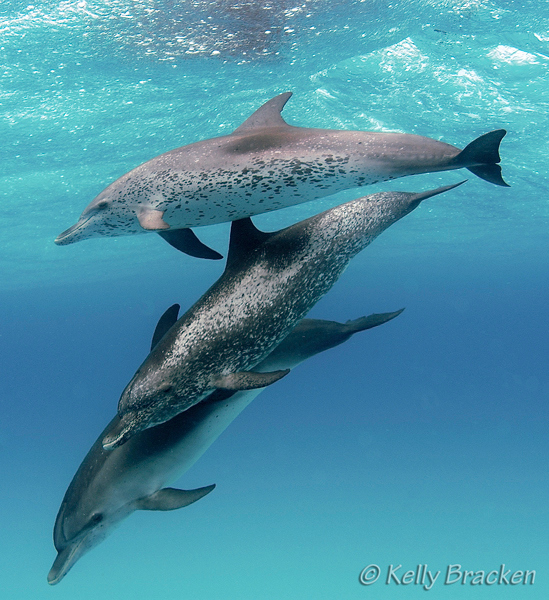 Three dolphins, bahamas. Photo by Kelly Bracken. d100, Nikon 16mm lens, 1/125th, F5.6. Shutter priority mode was used for this shot, no strobes were used. Kelly was snorkeling/freediving in 15ft of water for this shot. The sharpness of the shot, diagonal composition, and surface at the top of the photo all help make this a beautiful shot. 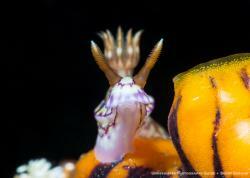 On a low visibility dive, you'll want a lens that can focus close, like a 60mm macro lens for small subjects, or a Tokina 10-17mm for large subjects Get as close as possible to your subjects. Zoom your Tokina out as wide as possible. Try to shoot closer than 12 inches. Put the strobes out wide, pointed slightly out to reduce backscatter. Use a dive light or focus light to help your lens focus on the subject. Don't let low visibility deter you from taking great photos! Just try not to shoot through more of a few inches of water, and you'll be fine. Visibility on this dive was 15ft at most, but by shooting very wide and bringing my strobes far out, I was able to get some shots. You may need to hold your breath to approach fish. They will be scared from the sound of your exhaust. Also, you can direct your dive buddy to swim behind the fish, driving them towards you. This will help you get fish-head shots, instead of fish tail shots. Visit our guide to fish photography. 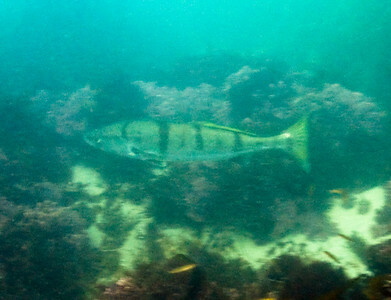 White sea bass in Malibu, CA, freediving, low visibility. F10, ISO 640, 1/125th. If I went out again, I might try F7, ISO 400, 1/160th. For a compact camera, I'd use F5, ISO 200, 1/160th. Because my lens was too wide, I had to crop this photo. A mid-range zoom lens or compact camera may have worked better. White sea bass are a good example of a skittish fish that is hard to approach. With fish like this, the best way to approach is by freediving, without scuba gear. 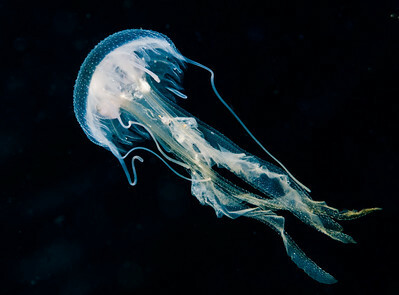 When freediving, I'll often use only 1 strobe to reduce drag. For best light levels, I'll try to go only when it's sunny out. Put your strobe out as far as it will go, and point it outwards to reduce backscatter. Try to swim down so you are at the same level as the fish or slightly below, don't shoot "down" at the fish if possible. White sea bass will usually make one quick pass, so be ready. It helps to really know your camera focus modes to get the fastest possible focus, and adjust your zoom before head. 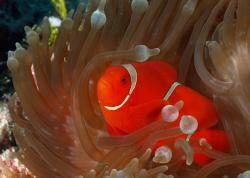 Here's an article on shooting in low light or low contrast conditions underwater. If the vis is not good, that makes it even more important to get as close to the fish as possible. 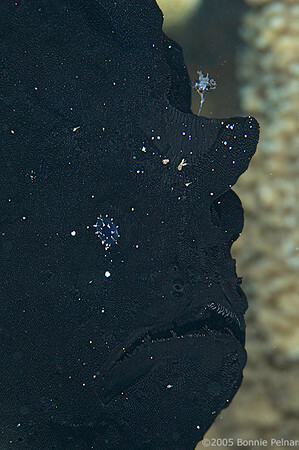 Strong Currents - use reef hooks if possible, to stay in one place, but never use reef hooks on live coral. Make sure you protect your dome ports from crashing into rocks. 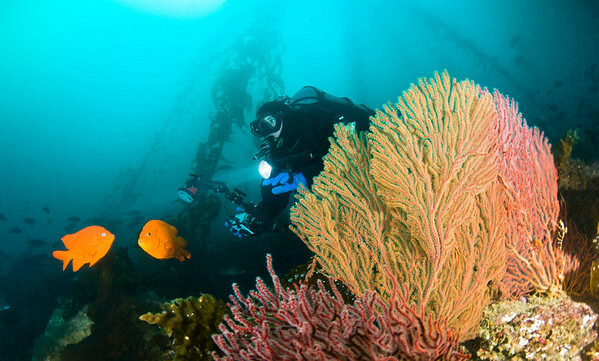 Add a couple extra pounds to your weight belt before the dive. Keep the eyes of the person in focus. Talk about communication and hand signals before hand. Expect that it will take a couple of dives to work out all of the hand signals. Don't shoot bubbles. communicate ahead of time about your model possibly holding their breath for a moment during a shot. Tell the model not to look at the camera, of course they need to occasionally glance at the camera to see your hand signals. Check their equipment for dangling hoses that might not look great in a photo. Skin tones of a model usually look best using a strobe at between 5000-5500K. The best model is someone you know well, ideally a spouse who will model for hours without complaining or asking for any money. Shots in darker water with a model holding a bright dive light or HID light can have a nice dramatic look. And last, I’ll say it again, discuss your goals & hand signals ahead of time, before each dive, with your dive buddy or model to make the most of the dive. Submitted by Anonymous (not verified) on Sun, 2010-09-05 08:42. Submitted by Murat Dilici (not verified) on Fri, 2009-10-30 09:55. I am a beginner in UW photo and this pages was wonderful for me.